Aloe vera plants are easily recognized by their long, pointed leaves that can measure up to 19 inches in length. For thousands of years, the leaves have been used for a variety of medicinal purposes. In more recent years, scientific research supports these claims. Aloe vera is a common ingredient in a number of topical beauty products and are available in gel or juice forms. Here are a few ways Rhode Island in-home caregivers can use this unique plant to benefit their senior loved ones. Aloe vera contains chemical compounds that are known to have antibacterial properties. The polyphenols within the plant also act as antioxidants, which help inhibit cellular deterioration of the skin. This dual purpose makes aloe vera an excellent antibiotic for seniors to eat. The soothing, cooling, antimicrobial characteristics of aloe vera make the liquid ideal for topical applications. In 1959, the FDA approved OTC topical products containing the plant for different types of skin problems. The plant is also effective for the healing of first and second-degree burns. Researchers also found that using aloe vera on burns reduces healing time. Gum disease and tooth decay are common problems among the elderly. In addition to routine brushing and flossing, live-in Rhode Island caregivers can help seniors prevent oral health decline by using mouth rinses or washes to reduce plaque formation. Scientists compared aloe vera formulas with mouthwashes containing chlorhexidine. During studies spanning from four to 30 days, aloe vera proved to be as effective as mouthwashes in keeping plaque at bay. The antioxidant properties in aloe vera slow the aging process. Additional compounds in aloe vera have shown promising results in increasing collagen production, which gives skin its youthful elasticity. To gain these benefits, seniors might consider using aloe vera gel periodically to freshen their skin. When used topically on a routine basis, aloe vera dries the skin, which makes the plant ideal for treating seborrheic dermatitis or dandruff. The plant juice dries the oily scalp areas that promote the scaling and subsequent shedding of skin. There are numerous ways your loved one can benefit from aloe vera products. 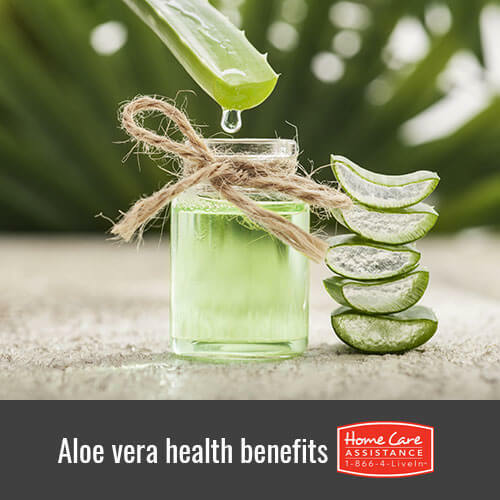 Learn more about aloe vera and other beneficial products for seniors when you call Home Care Assistance at (401) 284-0979 today. We are a reliable Rhode Island senior care agency that is dedicated to changing the way the world ages. Not only do we help seniors perform daily chores and activities around the house, but we also provide specialized Alzheimer’s, dementia, and stroke services. Set up a no-obligation consultation today when you call.